What has just come to light regarding Hillary Clinton has reduced her chances of becoming President. She does not deserve to hold the highest office of the land. Her lack of judgement is so profound that now the Democratic Party must scramble to find a viable candidate. The use of a private server to send emails while Secretary of State and the Clinton Foundations' acceptance of donations from foreign organizations while she was looking to run for President demonstrates poor judgement and an attitude of being above reproach. Expect Hillary Clinton to announce that before using her private server she consulted with private experts to make sure she was fully secure. This may be true but the point is the National Security Council, and at the very least the President, should have not only been informed but made the decision that the use of a private server was acceptable. Until a review by the NSC is complete the nation will not know whether our security may have been compromised. It is fortunate this came to light 20 months prior to the 2016 election. The Democratic Party needs to seriously look at Governors that may provide the skills necessary to lead our country. Here is a good alternative that is in the Senate. I am not endorsing her to be the Democratic candidate for President. I am suggesting that she be given a fair shot to prove she should be one. UPDATE April 25, 2015: Clinton's candidacy is further muddied with the recent revelations concerning donations the Clinton Foundation received from foreign countries and individuals while she was Secretary of State. 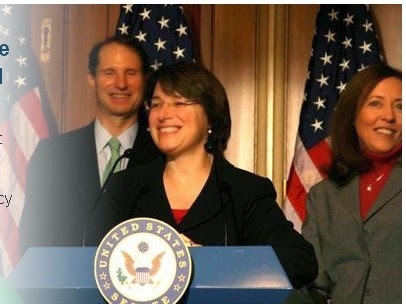 One viable replacement is Amy Klobuchar the senior senator from Minnesota. She has been in the senate since 2007 and has degrees from Yale and University of Chicago Law School. Below are Klobuchar’s positions relating to some current issues. Citizen’s United: In June 2014 Amy was a cosponsor of a constitutional amendment to allow Congress to override the Citizens United Supreme Court ruling. Education: She believes “no child left behind” is an unfunded mandate, early childhood opportunities need to be funded and she voted in favor of an additional $10.2 billion in federal money for education. The Democrats have some good candidates. Don’t cry over losing Hillary. Amy Klobuchar is one example. Below is a 4 minute video of Senator Klobuchar heading up a meeting discussing a possible merger of two cable giants. Below is a four minute video clip of Senator Klobuchar heading hup a Judicial Committee hearing on a proposed merger between Comcast and Time Warner.